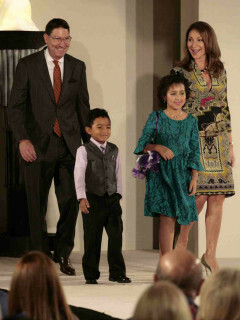 A remarkable group of Community Champions will walk the runway with young cancer survivors in a tribute benefiting Texas Children’s Cancer Center. The eighth annual luncheon and fashion show features a group of Houstonians known for their dedication to the community and support of charitable causes. This year’s honorees include: Barbara Lowrie and Henry Brooks; Jo Lynn and Greg Falgout with daughters Christine and Kimberly; Doe and Henry Florsheim; Mary and Tony Gracely; Nancy R. Calles and Dr. Mark W. Kline; Barbara and Ulyesse LeGrange; Penny and Paul Loyd, Jr.; Shelby Hodge and Shafik Rifaat; Alicia and Lance Smith; Tiffany and Rick Smith; Elizabeth and Alan Stein; Betty and Jesse Tutor; Cyvia and Melvyn Wolff.